How wonderful to be wise, to analyze and interpret things. Would it? Trust in the Lord Jesus Christ is the powerful gift one can have. Unshakable, trust will strengthen ones faith, creates hope and fills ones heart with love. 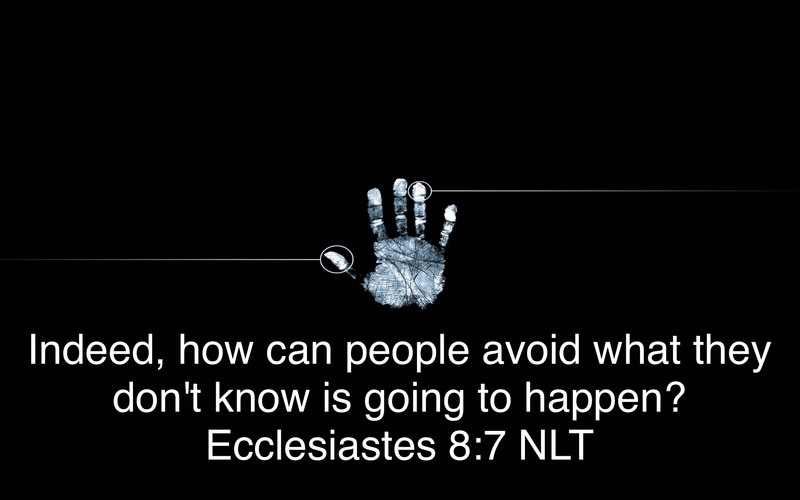 Indeed, how can people avoid what they don’t know is going to happen? And this is not all that is meaningless in our world. In this life, good people are often treated as though they were wicked, and wicked people are often treated as though they were good. This is so meaningless! In my search for wisdom and in my observation of people’s burdens here on earth, I discovered that there is ceaseless activity, day and night. I realized that no one can discover everything God is doing under the sun. Not even the wisest people discover everything, no matter what they claim. This entry was posted on June 29, 2018 at 6:19 am and is filed under One Walk. You can follow any responses to this entry through the RSS 2.0 feed. You can leave a response, or trackback from your own site.